Repair the World: The Time Is Now! The Anne Frank Project celebrates its 10th anniversary with a variety of lectures, performances, and art exhibits. 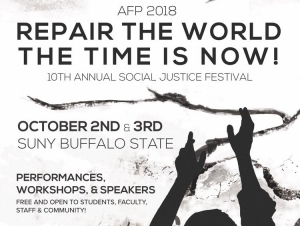 Check out the social justice festival’s schedule (PDF). Tuesday, October 2, 7:30 p.m.
Emily Boyce, pianist and associate professor of music, will perform Liszt’s “Dante Sonata,” and give a lecture on the composer. Admission is free for students and $10 for the general public and available at the Rockwell Hall Box Office, by phone at (716) 878-3600, or online. Wednesday, October 3, 7:00 p.m. to 9:00 p.m. The Powerful United Ladies Striving to Elevate, or P.U.L.S.E., will hold an event on learning how to be fiscally responsible. RSVP. Thursday, October 4, 12:15 p.m.
A recognition ceremony to honor faculty and staff accomplishments will be held on Thursday, October 4, at 12:15 p.m. in the Performing Arts Center at Rockwell Hall. 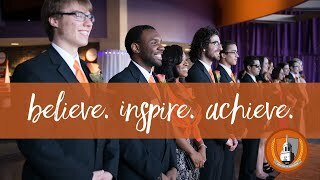 The event will recognize Buffalo State recipients of SUNY Chancellor’s and President’s awards. In addition, all new faculty and staff members will be welcomed to campus. The entire campus community is invited to participate in this seventh annual event. A reception will follow in the Rockwell Hall lobby. Composer, performer, and digital music instructor Ethan Hayden presents μ-movements, a concert of works which build expansive sound worlds from narrow bands of pitches or limited physical movements, and which includes music for trombone, voice, kalimba, and electronics. The program features two world premieres of new pieces by the composer—one for bassoon reed trombone, drum set, and electronics, and the other for chamber ensemble—performed by special guests f-f-f-f-Faulty Tower and Wooden Cities, respectively. The event is open to the public and $10 general admission tickets can be purchased online. Free student tickets (ID required) are available from the Rockwell Hall or Student Union box office in person only. Friday, October 5, 12:30 p.m. to 1:15 p.m.
Wilderness Adventures will meet to discuss events throughout the month of October and the organization’s upcoming camping weekend at Whispering Pines. RSVP. Saturday, October 6, 7:00 p.m. The 7th Annual Changemakers 30 Under 30 Awards celebrates the impact and accomplishments of young professionals from the Western New York region. This black-tie event will feature special performances from some of Western New York's most talented artists and is the largest awards show in the region honoring young professionals under the age of 30. The event is $20 for general admission.